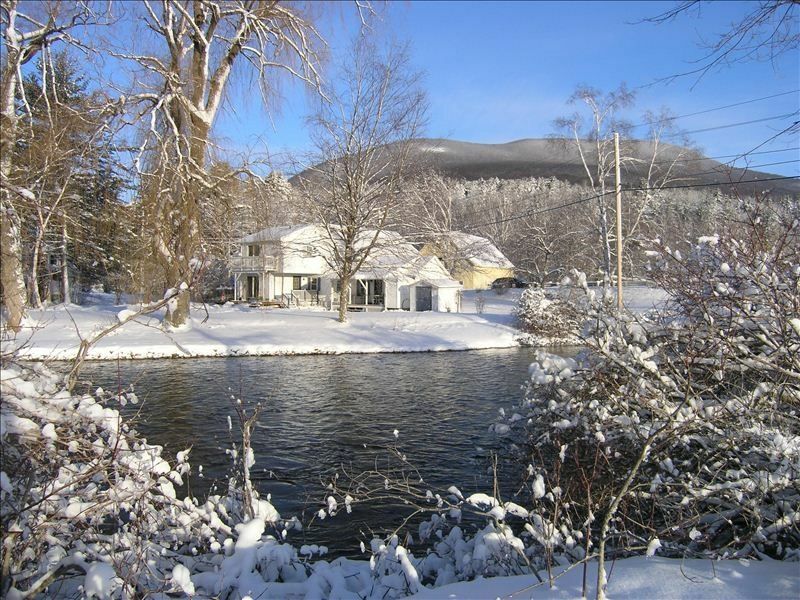 380 ft of PRIVATE and grassy BattenKill river frontage: This is a dream location for fly-fishers, kayakers, canoers, bikers, hikers, golfers, equestrians. Skiers, painters, photographers, writers will enjoy this Norman Rockwell's village home. The MASS MOCA, Dorset Horse Show, the outlets in Manchester, the Race track in Saratoga, Lake George.... are all with a short drive. Arlington Village is a 5 minute walk away. Stratton and Bromley ski resorts are ca.12 -16 miles away. Vermont with Charm, close to the NY and MA borders, 7 miles to Manchester and its outlets, restaurants. Close to Bromley and Stratton ski resorts, in a recreational area. This nicely furnished home is not 'just a rental.' It has a lot of character and style. There is not a better location on the Battenkill: watch the river, fish, and kayak or canoe from your own backyard, cook, enjoy life on the river. The Kitchen was an 18th century one room house, the main core was built ca. 1840; the living room and Master bedroom are a 20th century addition. UNIQUE: ca.100 feet from the water! And packed with a lot of fun, character, and light! Older, refinished golden wooden floors in older construction, new woods (cherry and oak) in Addition. Brand new oil heat furnace (March 2010) and water baseboard radiators, two zones. Woodstove in Living-Room. Keywords: Delightful, old world, French, Hawaiian, Victorian, tri-centennial home! Surrounded by mountains & the Long Trail is nearby. 380 feet of private grassy waterfront. You can play in the water, fly-fish, kayak.... a throw stone away from the house. 380 feet of private Battenkill waterfront, shady & sunny spaces. Eat or drink while watching and hearing the river. 2 kayaks available: private put in take out... Great fly-fishing hole. 2 window units are installed in the 2 bedrooms. Cool breeze and cool house anyway. Fuel Furnace: 2 ZONES with water baseboards. Decorative non working fireplace in dining room but working (open faced) wood stove in living-room. 2 kayaks available for free, at your own risk. See kayak section. Boat rentals available at various rental stores in the area. 2 ski resorts (Bromley and Stratton) within 30 minutes. In rec park, across the rd. We enjoyed our stay in this charming home, and especially enjoyed spending time along the river bank. The owner is wonderful... giving us lots of information about the area, and was always available for questions. It is a lovely spot to stay and explore the surrounding countryside! We were welcomed with a phone call from the owner, Brigitte, the week before our stay and she was delightful...giving us ideas as to where to go during our trip. The property was convenient to the things we were looking to do yet away from the hustle bustle of Manchester & Bennington. The property itself is what it is... an older home with a few blemishes yet still comfortable & clean. It served our needs and is pet friendly with plenty of outdoor area for him to play. A great starting point for various day trips in any direction. The only issue was on evenings when we were “home” and wanted to watch TV, the small screened television was rather tedious to watch, and the DVD player didn’t work. Not a big deal but still somewhat of a disappointment. Overall, we were pleased with the property... just don’t expect a 5 star experience! I am glad you enjoyed my house and its location but I am sorry that your TV experience put a damper on your visit. The house has cable TV and, at $150+/month, it should provide ample choices without having to use the DVD. Maybe you had a bad connection. I wish you had told me then, I could have resolved that issue with Xfinity during your visit. TV had not been a important point before, I will look into getting a larger screen for the next season. Thank you for your feedback. We had a wonderful holiday in this lovely country cottage by the river. Brigitte (the owner) was very responsive and helpful. The location by the river was just perfect for lazy summer afternoons. The house is cozy with a LOT of charm - we loved browsing through Brigitte's incredible collection of books and paintings. The location in the "Shires of Vermont" was fantastic with Manchester, Shaftsbury, Bennington, all within a few minutes drive. We hiked, kayaked, visited the home of Robert Frost, the house of Norman Rockwell, the summer home of Robert Todd Lincoln -- all easy day trips. We wished we had more time and are hoping to come back! Right from the beginning Brigette, the owner, was extremely responsive and accommodating. She even went to the trouble of talking with me by phone to tell us all the tips for things to do in the area, etc. The house was comfortable and the access to the river is great. There are really nice views from many of the rooms. If you like to Kayak or Bike it’s perfect. Lots to do in the area. Great weekend getaway. We had a great 2 day stay and wish we had more time. The owner was fantastic to deal with - she was very responsive and really went out of her way. The house has a lot of charm and the location is perfect. We’ll be back for sure! We enjoyed a peaceful snowy weekend by the Battenkill. Skiing at Bromley was convenient and we were able to do a nice snow hike along the river. Arlington is a great little village with well stocked convenience and grocery stores five minutes from the house. A huge plus when traveling with three small children. Fly-fishing, kayaking, canoeing, hiking, biking from the house to: the red covered bridge: 4 miles, to the NY border: 7 miles, to the Hudson: ca. 21 miles.. Golf across the river (9 holes) and major golf courses in Manchester and Dorset within 7 miles. Bromley Zip-line within 20 minutes. Dorset horse Show: 15 miles, Saratoga Springs race track and SPAC (NY City Ballet + concerts) 35 miles. MASS MOCA: 30 miles.... Lake George 35 miles, Art in Manchester, Williamstown, Amazing bookstore: Northshires Bookstore in Manchester: great books and lectures. Wonderful hikes all around. It's great there, and around!!!! OPEN TO YEARLY RENTAL and DISCOUNTED RATES FOR LONGER PERIODS, CONTACT OWNER.